Co-written by Bong and Welsh journalist Jon Ronson, whose books and articles inspired The Men Who Stare At Goats and Frank, Okja never shies away from the more grotesque side of satire, going so far as to spoof the sacred Last Supper of hawkish neoliberalism: Pete Souza’s famous photograph of the White House Situation Room during the raid on Osama Bin Laden’s compound, with chief Mirando strategist Frank Dawson (Giancarlo Esposito) in the Obama spot, complete with a windbreaker and polo shirt, and CEO Lucy Mirando (Tilda Swinton) covering her mouth à la Hillary Clinton, though only to chew at her cuticles. (Although she plays Lucy as a parody of cynically trendy, mock-progressive “new” CEOs, Swinton does a Clinton impression as Lucy’s twin sister and ousted predecessor, the smug and scheming Nancy Mirando.) But though this Netflix production is head and shoulders above War Machine, the streaming giant’s most recent attempt at mounting a satire on a sizable budget, Okja suffers in comparison to Bong’s previous swipes at class resentment and the globalized American agri-military-industrial complex. It’s neither as deliriously realized and in-your-face as Snowpiercer nor as sensitive as The Host. But this is still Bong Joon-Ho we’re talking about—a director who can mount chase set pieces with the best of them. 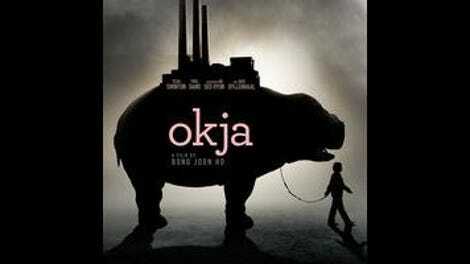 One exhilarating sequence of scenes, which comes after Okja is whisked away for her big gala presentation in the United States, follows Mija through Mirando’s South Korean corporate office; to a truck chase through the streets and traffic tunnels of Seoul, interrupted by the arrival of the Animal Liberation Front, a motley crew of ski-mask-wearing animal rights radicals, led by the principled Jay (Paul Dano); and through the shattering storefronts of an underground shopping center, where Animal Liberation Front members square off against tranquilizer-gun-toting Mirando henchmen while trying not to hurt anyone. (They’re pacifists, as Jay explains.) Bong’s camerawork, which has been earning Spielberg comparisons since the breakthrough of The Host, plays with scale and distance: water rippling in a glass as a partition wall wobbles nearby; the huge super-pig leaving a smudge the size of a minivan as it slams against a glass shopping center wall after slipping on the waxed floor; toys and stationary flying everywhere as the animal comes to a crashing stop in a store. One might call the movie a clash of different cartoon sensibilities. 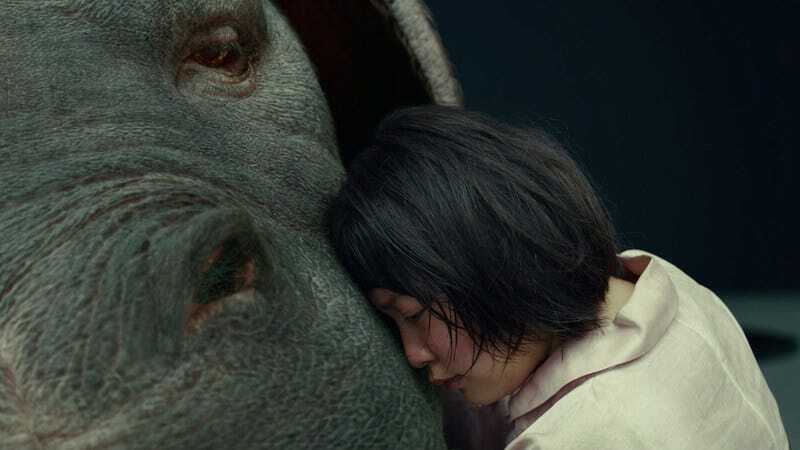 On the one hand, there are the scenes between Mija and her loyal, genetically engineered best friend, which in their finest moments bring to mind the work of Hayao Miyazaki’s Studio Ghibli, rendered in loving action. On the other, there are the wacky and outlandish caricatures of largely English-language Mirando sections, with over-the-top press conferences, and Thanksgiving Parade-sized pig balloons, and Gyllenhaal’s manic, deeply bitter, sweat-soaked Dr. Johnny jumping around like a cross between Steve Irwin and Richard Simmons. Perhaps the fact that these two sides of the film seem incompatible is intentional: The bucolic values of agrarian life don’t sit well with the crassness of the corporate blitz. It might be blunt, but at least it’s a point.